PARIS AND LONDON — Britain and France this year will make major decisions about modernizing their armored vehicle fleets in projects worth billions of pounds and euros. This month, French industry is expecting to sign contracts with the government for the Scorpion project, which involves developing and building a reconnaissance and combat vehicle, as well as a troop carrier. Britain, meanwhile, struck a fixed-price £3.5 billion (US $5.6 billion) deal with General Dynamics UK last month to build a family of Scout specialist armored vehicles, including a reconnaissance machine for the British Army. In France, the Scorpion project aims to deliver a medium-weight reconnaissance and combat vehicle, or engin blindé de reconnaissance et de combat (EBRC), for the Army’s cavalry regiments. The EBRC will be “very modern and very heavily armed,” an industry executive said. “It’s a new concept.” The EBRC will be equipped with the CTA International 40mm cannon and MBDA medium-range missile, or missile moyenne portée. CTAI is a joint venture between BAE Systems and Nexter. “Such a heavily armed vehicle does not exist on the market,” the executive said, adding that the EBRC will fall into the medium-weight range of 20 to 25 tons. A second executive said the six-wheel-drive vehicle will be closer to 25 tons. That compares with about 32 tons for the German Army’s Puma, a tracked armored infantry fighting vehicle. Lockheed Martin UK would be happy to assist if the company were asked to work on the EBRC turret, a British industry source said. The second French executive said the British firm would have a tough job beating a competing offer from Nexter, the French land systems specialist. “They do not have much chance,” the second executive said. Lockheed is working on turret integration for the Warrior infantry fighting vehicle and a new Scout vehicle for the British Army, both using the CTAI cannon being installed by France, but that may not be enough to win a French contract. The French authorities picked an all-French team of Nexter, Renault Trucks Defense and Thales to work on the Scorpion EBRC and a troop carrier, the véhicule blindé multirole (VBMR). Nexter worked with the Direction Générale de l’Armament procurement office on its T40 turret for the EBRC, a company spokesperson said. A first EBRC is due for delivery in 2020, with a total of 248 units, a defense official has said. The unit price for the combat vehicle is estimated at €4 million to €4.5 million (US $5 million to $5.6 million), totaling up to €1.1 billion, excluding sales tax, based on an industry estimate. For the VBMR troop carrier, the Army chief of staff has set a price target of some €1.5 million, including €500,000 for the electronics and sensors, the second executive said. “It will be difficult to reach,” the executive said. A prototype is due in two years, with production expected in 2019. The VBMR will replace the four-wheel-drive véhicule avant blindé (VAB). The EBRC will replace both the ERC-90 Sagaie armed with a 90mm cannon and AMX 10 RC with a 105mm gun. 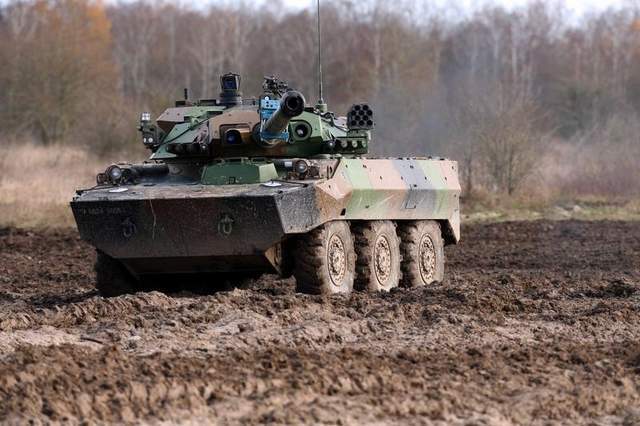 An initial €5 billion has been earmarked for the first phase of the larger Scorpion project in the present six-year military budget law, with the same amount in later phases. The project encompasses a new combat information system, integrating the Sagem Felin infantry gear into the vehicles and a training simulator. There will also be work on modernizing the Leclerc tank. Nexter Chairman Philippe Burtin told the parliamentary defense committee in September 2013 that upgrade work of the 200-strong tank fleet is due to start in 2018 and delivery in 2020. That time frame was important as it “opened the possibility of a good synchronization” on work for the EBRC turret and onboard electronics for the VBMR and EBRC. Industry hopes to sign contracts for the two new vehicles this month, and if approved following ministerial review, the first executive said, the contracts would go into effect by the end of the year. Nexter is in talks with Germany’s Krauss-Maffei Wegmann to create a joint holding company, seen as a big step in European consolidation in future programs. One French executive described the Scorpion vehicle work as being of structural importance to industry. Years ago, the British government abandoned any requirement to build its major armored vehicle orders locally and industry’s assembly capabilities have waned accordingly. A General Dynamics offer, as part of its original bid for the Scout program, to have the bulk of the Scout fleet assembled by Britain’s state-owned Defence Support Group evaporated by the time it came to negotiate the production deal. Instead, all the vehicles are slated to be built and tested at General Dynamics European Land Systems’ plant at Santa Barbara Sistemas in Spain, albeit with British content in systems and sensors topping 60 percent. General Dynamics secured a £500 million design and development deal with the British in 2010 based on a substantial upgrading of its ASCOD vehicle built for Austria and Spain. Now the focus is switching to production. British Defence Procurement Minister Philip Dunne told Defense News that the MoD had recently asked General Dynamics to look again at the economics of transferring some of the build work to the UK. “The first 100 vehicles are being assembled in Spain. We have an option to assemble the rest in the UK and we have asked General Dynamics to scrub the numbers and look at that,” Dunne said. The procurement minister said the original pricing differential between Spanish and British assembly made Santa Barbara the best option for UK taxpayers. Francis Tusa of Defence Analysis is not so sure the British couldn’t have had the best of both worlds: a good deal for taxpayers and local production. “The question has to be asked: If countries as cash-strapped as Belgium can ask for and get production/assembly of vehicles [60 Pandur 1s] at a cost-effective level, then why was it not economic for the UK with an order for 589 vehicles worth £3.5 billion,” he said. While the debate over where the Scout family will be built rumbles on, General Dynamics is preparing for a key program milestone; the critical design review of the CTAI cannon-equipped reconnaissance version. A General Dynamics spokesman said Scout reconnaissance is on track for its critical design review before the end of the year with MoD field trials scheduled to get underway in 2016. A source familiar with the program said Lockheed Martin is planning a critical design review of the turret this week. The source said the company already has a baseline turret fitted and working, including the 40mm cannon, and intends to start live-fire trials next year. The Rheinmetall-designed turret is being integrated with sensors, weapons and other equipment by the UK arm of Lockheed Martin. General Dynamics is expecting its first production standard turret next year, the source said. The first vehicle off the delivery line will be the protected mobility reconnaissance support platform. Awarding a build contract before the critical design review of the key reconnaissance vehicle had been completed has raised a few eyebrows. Gray said the ability to negotiate an extremely attractive contract offered significant advantages over waiting. Galería | Esta entrada fue publicada en Hemeroteca y etiquetada C4ISR&NETWORKS, GDELS, General Dynamics, Santa Bárbara Sistemas, Scout, Trubia. Guarda el enlace permanente.